Tornado Watch Issued. Hail and tornado reported north of Denver. UPDATE, 1:13pm – Severe damage appears to have been caused by the first tornado to strike today. The Greeley Tribune is reporting one possible tornado death near the missile silo park near Colo. 257 near 10th Street in west Greeley. Reports are that old town Windsor has been heavily damaged. UPDATE, 12:38pm – At 12:23pm law enforcement reported a tornado 4 miles west of Dacono (24 miles north of Denver). Storm is moving at 33mph. 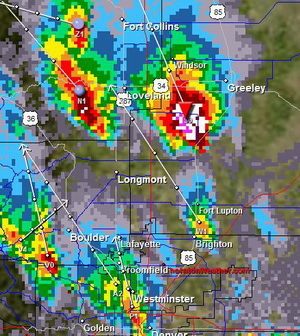 A Tornado Warning is active for the immediate area including Niwot, Dacono and Longmont. The National Weather Service has issued a Tornado Watch effective until 8:00pm tonight for much of the central plains including the Denver metro area. Visual and radar indications show great potential for severe thunderstorms, hail and tornadoes in the area under the watch. At 11:30am radar showed a tornado touching down three miles east of Milliken (about 45 miles north of Denver). The radar image at the right shows the cell in its early stages with a tornado signature. Reports indicate that there have been no injuries but officials have closed Highway 85 at Highway 60 after two semi-trailers were blown over in that area. Power is reported out in Greeley. All readers should be reminded that a Tornado Watch is issued by the Storm Prediction Center in Norman, Oklahoma as a precautionary alert when conditions are favorable for the development of tornadoes in the specific area. You may wish to familiarize yourself by reading our Severe Weather 101 – Tornadoes article. Please stay tuned to area media outlets for more information as this afternoon’s weather develops. This entry was posted on Thursday, May 22nd, 2008 at 12:25pm MDT and is filed under Colorado Weather, Severe Weather, Thornton Weather. You can follow any responses to this entry through the RSS 2.0 feed. You can skip to the end and leave a response. Pinging is currently not allowed.